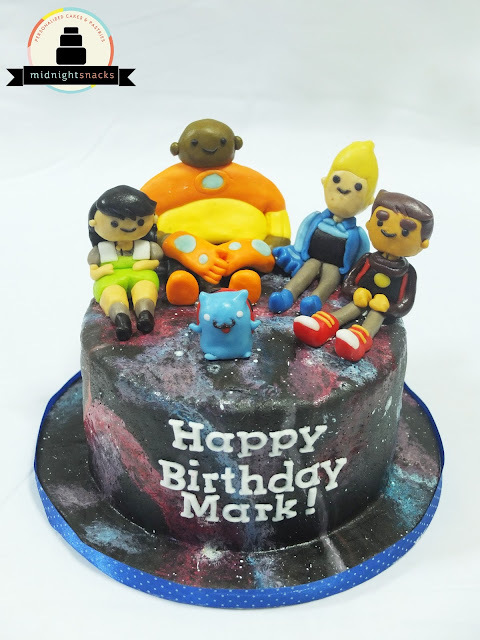 Recently, we received a cake order with the theme, The Bravest Warriors, another cartoon made by the same creators as the famous Adventure Time animated series. The cartoon is set in space. 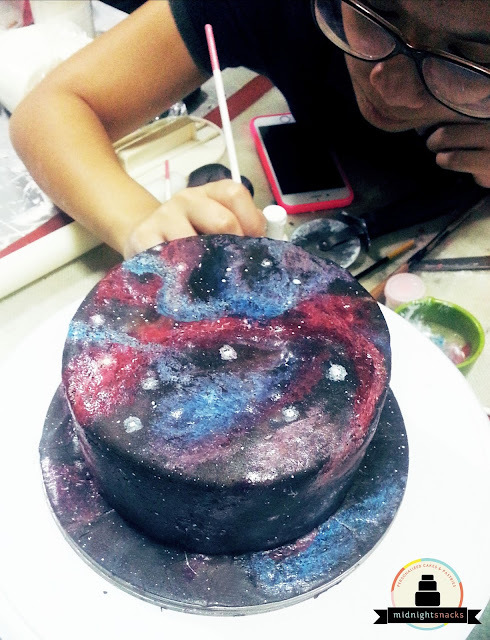 So, we agreed on painting the whole base cake with a galaxy background. We learned from the video tutorial we found on Youtube created by Sea Lemon (I've just subscribed to her channel and I'm starting to love her art and DIY crafts!!! Make sure to check it out! ), to give us an idea of how to paint this kind of print on cake. 1. Mix the first color with a bit of white. Start by making light dabs on the cake until you form random curves. 2. Do the same with the second color. It's okay to overlap some curved strokes on the first color. 3. Once you are happy with the strokes you've made, make circular dabs with the white gel paste. Put a solid white dot/circle on top of it. This creates a halo effect and will look like bright big stars on your cake. 4. With the help of a pairing knife or metal scraper, dip your brush into the white gel paste and start flicking crazily until you're satisfied. 1. You can add or change the colors depending on your/client's preference. We made the usual pink/purple/bluish galaxy print since it is the most recognizable. 2. Make sure to put light dabs, specially if your fondant isn't thick. Heavy dabs might poke your cake. You might end up with a very colorful moon planet or something rather than a smooth 2D galaxy print. Haha!